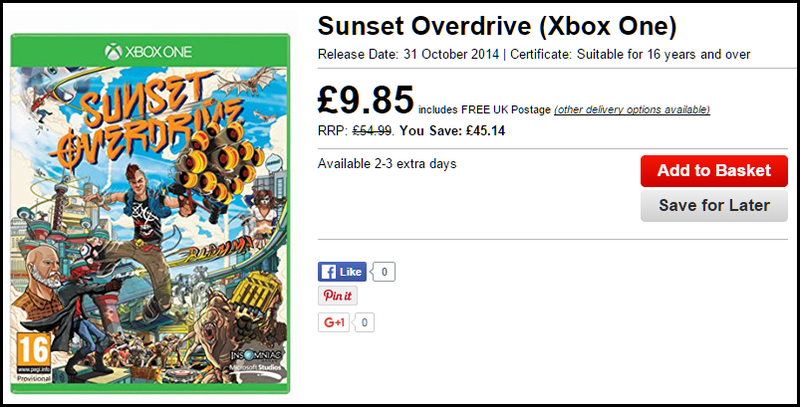 Sunset Overdrive is now available for under a tenner from Base. I’ve never played it myself so can’t comment on the game play, but it has had favourable reviews from the critics. It’s from Insomniac Games, perhaps better known for their other games, Spyro, Ratchet & Clank & Resistance. 2027. Sunset City. A contaminated energy drink has transformed most of the population into a multitude of toxic mutants. For many it’s the end of the world, but for you it’s a dream come true. Your old boss? Dead. Your boring job? Gone. Transform the open-world into your tactical playground by grinding, vaulting and wall-running across the city while using a devastating, unconventional arsenal. With hyper-agility, unique weapons, and customizable special abilities, “Sunset Overdrive” rewrites the rules of traditional shooters and delivers an explosive, irreverent, stylish, and totally unique adventure exclusively to Xbox One. View prices at other retailers on the Sunset Overdrive price comparison page.